This multi-toned pendant catches light with its gorgeous blue jewel and then amazes with its beautiful coloured Zircon Stone. 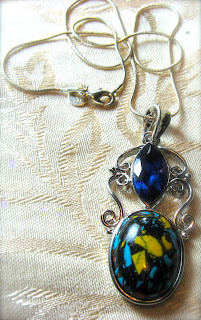 Set in Sterling Silver and hanging on an 18" Sterling Chain. Looks great with any outfit. A one of a kind gift for someone you love especially if it's you!